A pretty little purse with a pop up gift card inside is a fun surprise for any occasion, especially when it’s handmade by you. Created with card stock, this project looks like black leather with a fuzzy animal print. When the purse flap is lifted the gift card reveals itself. Little details like a metal clasp on the flap and top stitching on the front and back give this purse a designer look. Everything is ready for you to print, cut, and assemble. All pieces are included with the instructions. As a bonus, I’ve included two gift card holder pieces with this project - one with a Happy Birthday message and one blank for you to include “Merry Christmas!”, “Congratulations!” or the greeting of your choice. Allow glue to set thoroughly between steps. When assembling this project, apply glue no more than 1/4" inside the purse edges to allow the movable gift card holder room to slide up and down. step 1 - Print and cut out the the pattern pieces. Print the lining “B” on regular copy paper and the other pieces on card stock. Cut out all pieces with a craft knife or scissors, or stencil cutting machine. The cut files are at the bottom of this page. step 2 - Glue the blank side of the lining “B” to the blank side of the purse back“A” matching the edges of the flap. step 3 - Glue the blank side of the purse front“D” to the printed side of the lining matching side and bottom edges. step 4 - Fold the front flap where indicated with the thick black edge resting behind the fold on the backside of the purse. step 5 - Use template “D” to cut the credit card slits in the card holder. This template is not necessary for Silhouette users. step 6 - Fold the printed card holder “C” on the line indicated. Apply glue to the blank side of “C" above the fold line and along the curved edges. Press the glue side to the printed side of the lining. step 7 - Tuck the bottom edge of the card holder inside the purse front. step 8 - Glue the purse handles with unprinted sides together. With a small brush apply Diamond glaze to one side of the handles. When dry, flip them over and glaze the other side. Paint glaze on the black bottom corners of the purse front. step 9 - Flatten the prongs on the square stud. Apply E6000 glue to the back and attach it to the bottom center of the flap. step 10 - Apply glue to the handle ends and attach them to the top of the front flap. step 11 - Insert a gift card in the holder. The cut file was created in Silhouette Designer Edition V3. If you have an earlier version you may not be able to open it. 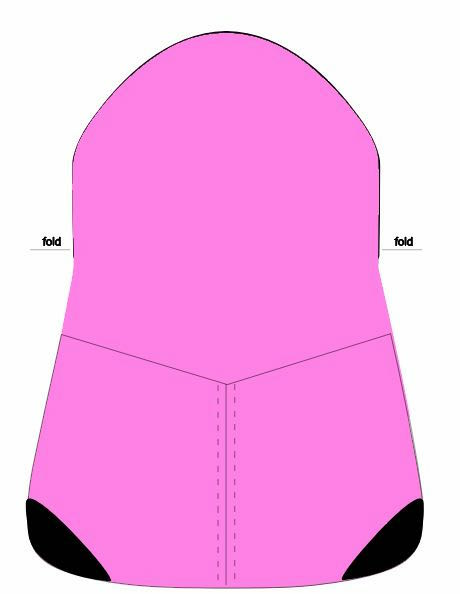 Another option is to download the pdf template and instructions, copy the image, and trace it into your silhouette program.